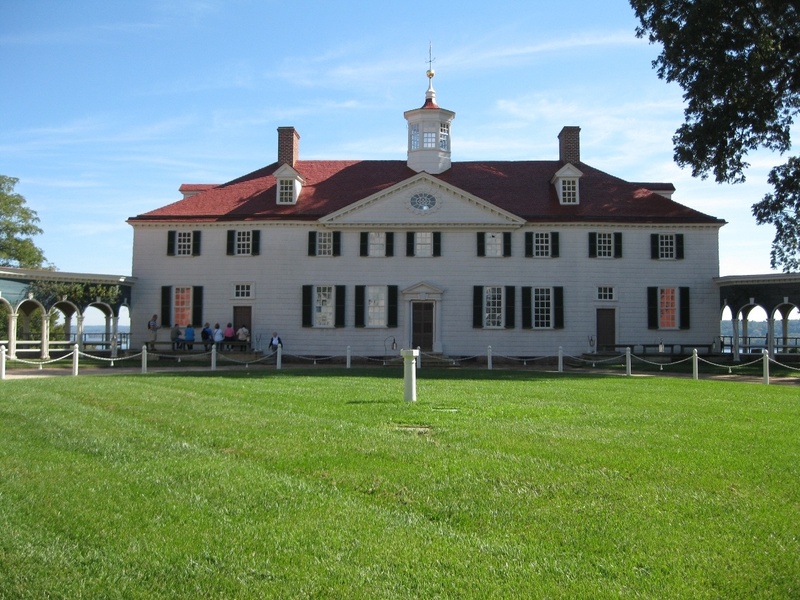 Today was another early start as we needed to make our way to Mount Vernon, George Washington’s former home over on the Virginia side of the Potomac River, and if time permitted, take a look at the Holocaust Museum off the National Mall back in Washington DC before returning 'home'. After our bus journey from the campground to College Park station the Metro train took us all the way to Huntingdon the nearest station to Mount Vernon. Unfortunately there was a long delay there for the final bus to take us to the Mount Vernon estate www.mountvernon.org. The weather was gloriously hot and sunny and by the time we arrived we’d been travelling for 2¼ hours. I must confess I didn’t expect to enjoy today, I’m not really in to old brown furniture in rooms with old brown pictures on the walls, in what are often old brown houses with brown walls, but this was Rosina’s trip, and she has been sporting enough to endure days of air museums over the past few weeks, so the least I could do was suffer some brown furniture, but it turned out to be a very interesting visit. The house was not as large and grand as I thought it would be, which I think helped. 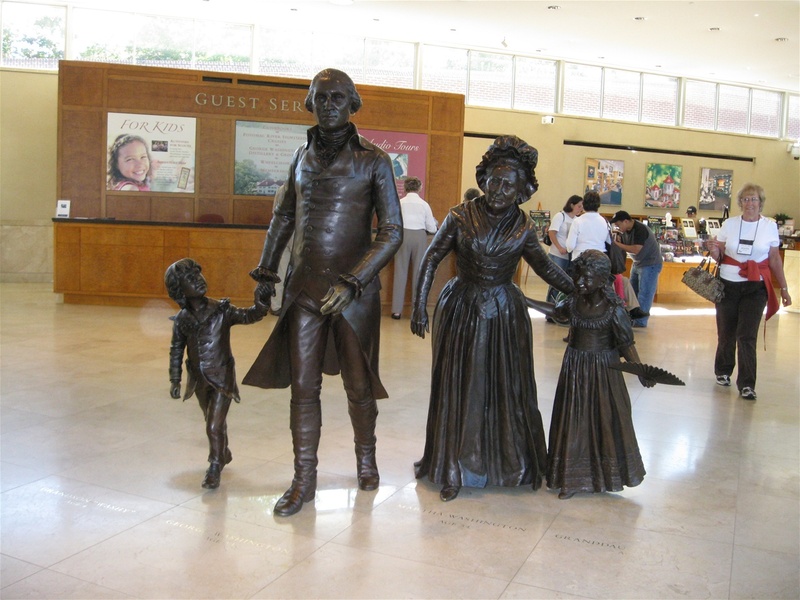 First we visited George Washington’s vault where he and his wife Martha’s remains lay. 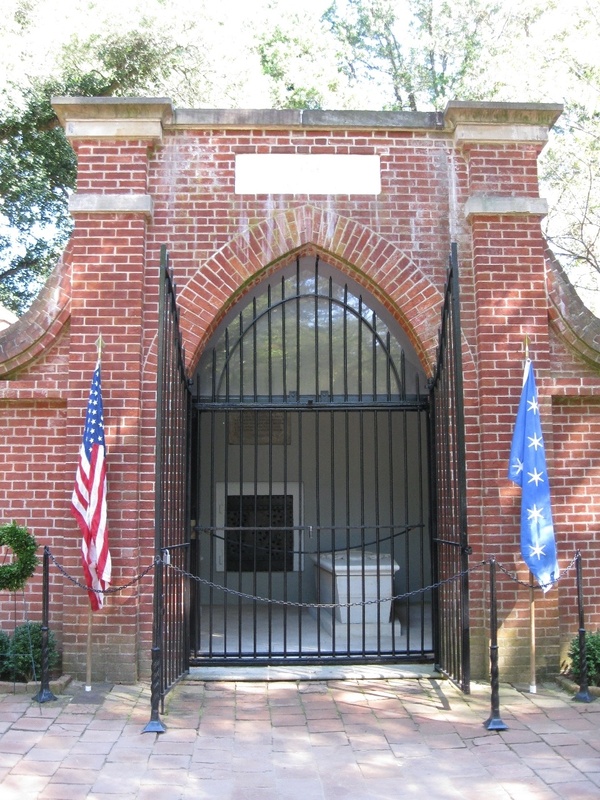 There is a locked steel-barred gate in front of the marble coffins. Had we taken a packed lunch with us and manged to get through the gate, he’d have made a smashing picnic table. Behind them both is a black steel door in the wall leading to the main part of the vault where numerous family members lie. After the tomb it was off to find the old vault where they used to lay until it was raided resulting in the new, more secure tomb being built. Then it was off to the house itself for a tour around it, passing various interesting out-houses along the way. During the tour we were shown various original pieces of furniture including a chair in George Washington’s study in which he sat and ran the country whilst President of the United States, later bringing it with him to Mount Vernon at the end of his presidency. All in all it seems that George Washington was a great statesman, he lead their army to victory against the British in the American Revolution, was the nation’s first President and an all round good egg. There’s only one problem I have with him, and that’s the fact that he owned slaves, 316 of them in fact, 97 at the Mansion House Farm where they served primarily as house servants and skilled tradesmen, and the rest were accommodated, and worked on the other farms on the estate. He also had servants which were housed in a wing to the side of the main house in reasonable living conditions, whilst the slaves were accommodated in buildings nearby, sleeping close together on straw bunks or in accommodation down on the farm. There are 150 slaves buried there, yet the best that can be done is to erect a marker stating that their unidentified graves were all in that general area. How can you lose 150 graves? For this reason alone I struggle to consider him an all round good guy. It was pointed out to us that he gave his slaves their freedom in his will, but only after his surviving wife had no further need of them. After our visit we made our way back to Washington DC by bus and Metro in order that we could visit the Holocaust Museum. After a long walk from L’Enfant Metro station we arrived and after the usual quick bag search were in. We had a wander around before discovering that we couldn’t get to some of the displays as we needed a special pass and these were issued out at 09:00 every morning. We just couldn’t take to the museum at all. Whilst having the utmost respect for the suffering of Jews and other persecuted races we didn’t feel this museum quite got the message across. Some years ago whilst on a touring holiday through France and Switzerland, Rosina and I visited Le Struthof, which was the only WWII concentration camp to be built on French soil. It was one of the most disturbing places I have ever visited, there were no birds singing, it was silent. There was a crematorium where bodies were disposed of and behind it a pit where their ashes & remains we tossed. There were gallows on which prisoners were hung in full view of other prisoners, and inside the buildings lots of photographs and memorabilia documenting their pain and suffering – believe me, that got the message over, but this place looks as if it was designed by a committee. Accordingly we didn’t stay too long, as The Chef commented “I’m glad we didn’t hurry from Mount Vernon to get here”. The Chef wanted to take one last stroll down the National Mall on our way back to the Metro station. This was a nice way to end not only a busy day but a hectic week, in which we’d spent an awful lot of our time either travelling on buses or Metro trains or standing around waiting for them, but it had all been worthwhile. We feel we’ve ‘done’ Washington DC and leave having seen and done everything we wanted. On return to our campground we set about preparing for a barbecue, washed down, of course, with lashings of wine. LOCATION TONIGHT: Cherry Hill Park, 9800 Cherry Hill Road, College Park, MD 20740. 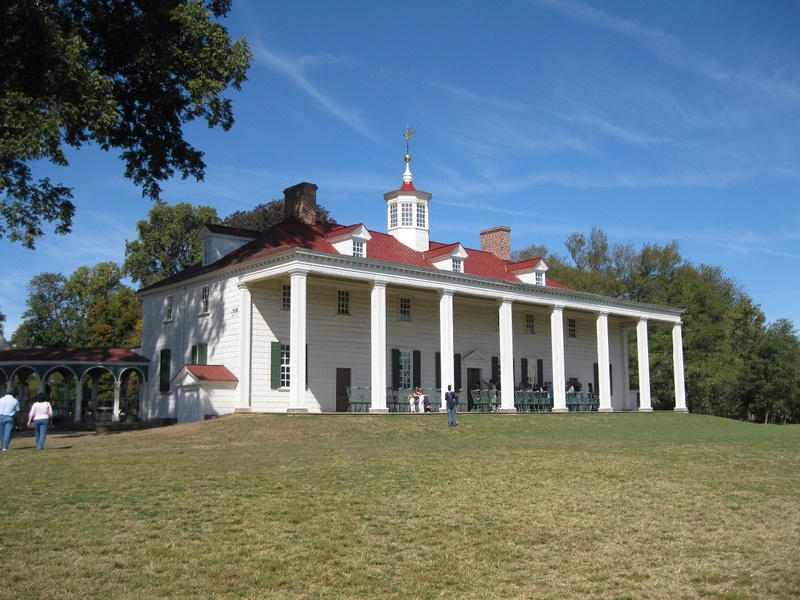 The rear of George Washington's home with views over the Potomac River.